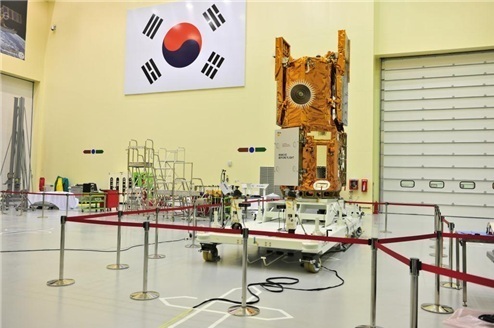 Korea to launch first radar observation satellite in Aug.
South Korea will launch its first radar-equipped Earth observation satellite capable of providing images in any type of weather condition, in an important step in developing its commercial space program. The Ministry of Science, ICT and Future Planning announced Thursday that the satellite KOMPSAT-5 is scheduled for lift off on Aug. 22 from a Yasny launch base in Russia. The ministry said the SAR satellite would eliminate limitations of traditional satellites, such as monitoring flooding under heavy clouds. The satellite will fulfill the country’s demands for various SAR images and developing infrastructure toward the commercial space market, according to satellite developer Korea Aerospace Research Institute. Korea made major strides earlier this year by successfully launching its first locally assembled space rocket KSLV-1 from its own soil for the first time. It now aims to develop an indigenous 10-ton thrust liquid-fueled rocket engine by 2016, a 75-ton thrust engine by 2018, and a 300-ton thrust engine that can carry a 1.5-ton satellite into outer space by 2020.